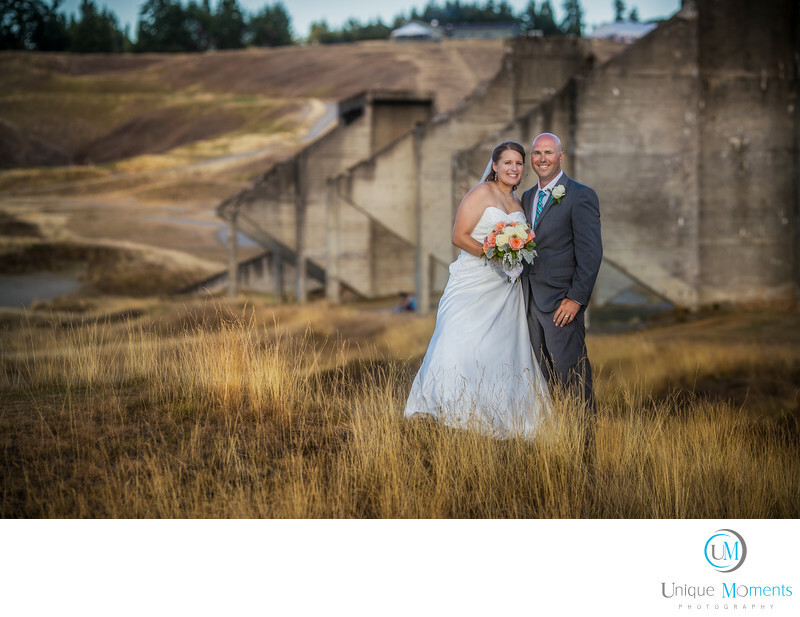 Unique Moments Photography from Gig Harbor Washington was honored to photograph Shelby and Marc’s awesome wedding at the Chambers Bay Golf club. Chambers Bay ? That’s the place where the best in the world showed up in Washington to play the US open golf tournament last year. Guess what ? Thats takes 2nd place to the wedding venue that over looks the sound at the facility. When we met Shelby and Marc, we knew they were a great fit for us and we were so excited when we got the call to send over the contract. We have been on Pins and needles for this one all year. The day started off with Shelby getting ready at her parents home and a First look on the golf course behind the home. Marc held up well, fought off some tears of joy, and they had a wonderful private moment. Then it was off to the venue for family formals. The sun was super bright and reflected badly off the cement patio area so we wound up shooting formals later in the day. The ceremony started at 4:00PM and it could not have been any nicer. Guests were treated to a wonderful ceremony over looking Chambers Bay and the Puget Sound. The view does not get any better than from the hill top of this venue. Guests are always amazed. Its was an typical awesome Washington summer day with the temperature right at 78 for the ceremony. Just spectacular is all we can say. A Kiss for luck and the couple and guests headed to the tent for a wonderful dinner. The food at the venue was excellent and the staff was superb. It just doesn’t get any better. Shelby and Marc treated the guests with their first dance which was followed by a wonderful Father daughter dance. Speeches followed and the sun let up enough for the bridal party to head down to the bay for some bridal party pictures. Everyone had a blast and we quickly headed back to the reception to cut a cake and to dance the night away. A bouquet toss garter toss followed cutting the cake and we set up lights to capture sunset shots for guest,family and friends. 10:00 pm was here before you knew it and the limo pulled up to take mark and Shelby to the Love shack. But before they could get in the Limo, guests were waiting to send them off with a great sparkler exit. Marc closed the night when he grabbed Shelby and dip’d her over for a kiss goodbye for all the guests. She didn’t know it was going to happen. We must say that this was a really awesome wedding. We had wonderful families that were kind and treated us like we were part of the family. By the end of the night everyone was friends and on a first name basis. The staff at the Golf club was superb, the food is excellent, the views of the sound are to die for, the photo opportunities down at the water are excellent. Most importantly, Marc and Shelby are a wonderful down to earth beautiful couple. We were so happy for them and the families. When you get to be with some of these families you get a good feel for how lucky our couples are to have such great families to support them as they move forward in their lives. These were exceptional families and Marc and Shelby’s wedding was simply off the charts in the GREAT category. We had a blast. Location: 6320 Grandview Dr W, University Place, WA 98467.